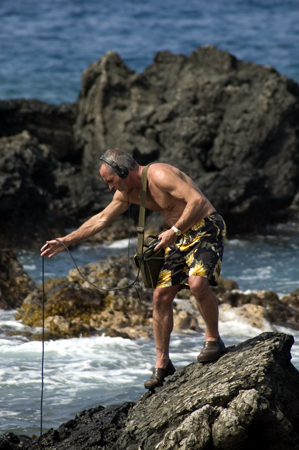 Gordon Hempton is one of the world’s foremost nature sound recordists. He’s won an Emmy, been the subject of a documentary, is an activist for acoustic ecology, and…in what many may deem a tragic irony…is also losing his hearing. Our focus on field recording this month is the perfect opportunity add his voice to our little community here. DS: How did you get into field recording…going out and capturing sound effects. I decided to get myself a microphone and a tape recorder.” I was so naive; I thought there was only one kind of microphone. [laughs] So when I walked into a Radio Shack and explained that I wanted a microphone and a recorder so I could become a better listener, he asked, “What kind of microphone?” [laughs] That was the dawn of my education, which continued for years. I didn’t have any money to speak of, because I was a student. So, I gave him my driver’s license as a deposit. He put headphones on me, and sent me out the door. As soon as that door opened and I walked out onto the streets of Madison, Wisconsin, I knew I had discovered something dramatic–just as dramatic as donning a face mask and being able to snorkel. I was real excited about that, and the authenticity of the unedited experience …this idea that I could explore the sonic world without anybody interpreting it for me…was so exciting that I actually dropped out of graduate school. DS: [laughs] No, no. That’s fine. You’re talking about this constant process of change. What are some of the significant changes you’ve found in your personal approach to recording, your personal approach to listening, over the years of your career so far. GH: Well, my personal approach hasn’t varied much. I’ve been mainly concerned all along with documenting the human experience of soundscapes. What is it like for you or me, to stand in a particular location, and listen to a place? My first exploration as a listener wannabe was in downtown Seattle recording punk rockers in front of Baby-O’s, and I enjoyed the dialog quite a bit. I enjoyed the ambience of the rock and roll music in the background and the traffic on the streets. I also hopped freight and enjoyed recording and interviewing hobos in their homes, which are called jungles, and the ambience that surrounded them. It was these “sound portraits” that attracted me first. Then that brought me to nature, and nature only, as my core interest. Because immediately when I started to record and listen to nature in pristine places, I heard music. I didn’t know of any other people doing this at the time, and in fact there were very few of us. When I heard this music, it really reached deeply into me. That, I think, was really the ultimate message of becoming a listener; that I had a deep past…a past that went beyond my years, and that I could really tap into the world of my ancestors. My core microphone has been, for decades, the Neumann KU81i dummy head. I have expanded, and I use a variety of systems all depending on the needs of the client and the location. DS: And how long…because we have a lot of young readers on the site as well, who are in college or recently graduated. They’re always interested in any sort of advice they can get, or the experiences of professionals from when they were just starting out. What was it like making the transition from that first recording with the Radioshack gear to working regularly for clients…going out in the field and recording? GH: That was a very difficult transition. I had, for nine years, a day job. Even after I knew that I wanted to be a professional field recordist, I still worked for nearly a decade on a bicycle in downtown Seattle…bicycle delivery service. It was really frustrating all along that I couldn’t break into the profession. It’s a very competitive area. I could not break into the system, even though I was very passionate about this. To tell you the truth, Shaun, at one point during those years, I said, “This is too difficult! I just have to give up. I’m being too dreamy.” But I found it’smore difficult to give up on your dreams than try to live them. You know,Walt Disney said something, “Dreams do come true, for those who have the courage to pursue them.” It certainly has applied to me. I also got an important piece of advice from Norman Durkee, a Seattle audio artist who’d been working in the industry for decades. I believe that he’s still alive and still producing great works. He said, “Do something that nobody else is doing, and do it well. There you’ll get recognition, and there you’ll have value.” So, that’s what I did. I made a decision that I would document these vanishing natural soundscapes and develop that the best that I could. From there, I applied for a grant from the Charles A. Lindberg Fund, which is now the Lindberg Foundation. They awarded me the purchase price of The Spirit of St. Louis to document the vanishing soundscapes of Washington State during its centennial as a culturally relevant resource. That was my break in 1989. I can say that you just have to stay ready, because when that door of opportunity begins to open you have to be totally ready. I did that, and then came all of the other dominoes of recognition. I received a Rolex Award for Enterprise, Associate Laureate, for The Dawn Chorus Project. Then that quickly followed with a PBS Emmy Award. So within a matter of just two years, I went all the way from being a bike messenger with a dream to an Emmy award winning field recordist. The gigs just lined up after that. I have to stress that equipment does matter. I would certainly also say, for the young starting recordist, experience counts. Don’t let a lack of expensive equipment stop you from recording. Whatever you have, get out there and record. The experience will make you a better recordist. Just like being a photographer. The more you shoot, the better your images will be. Same thing. The more you record, the better your field recordings will be. At every opportunity that you have to upgrade your equipment, do so. The most important piece of equipment starts right next to the sound producing event, and that’s your microphone. Definitely put money into your microphone first, and work backwards towards yourself. DS: That’s pretty common advice. Recorders come and go, and it’s easy to replace those…or for them to become obsolete. Microphones rarely suffer from that though. GH: Yeah, and there’s one more piece of advice that I’d like to give to the student or the young graduate. Find somebody whose work you really admire…somebody who you say, “I love their work!” and then offer yourself as an apprentice. For no money. Nothing. You will accelerate your learning curve so after even one week with a professional you’ll learn what would otherwise take years of working on your own. DS: That’s good advice as well. I want to shift back to something you were talking about during your recount of how you got started; talking about The Vanishing Soundscapes project and your focus on nature recording. I know you spent a lot of time in nature as a child and a teenager. How did your experience in the woods, and your investment in fauna and knowledge of the wild environments affect your recording process? GH: Oh! Sure, sure! Both when I was in high school and in college, I was an avid backpacker. I camped out and spent a lot of time observing nature. I’m sure that the sounds sort of secretly worked their magic in the background and made me, in some way, more ready to become The Sound Tracker. In my studies in college, which was botany…and in particular ecosystems analysis, I quickly understood that the vegetation…just by looking at and studying the vegetation, in effect you’re studying the musical score for nature’s music. Wildlife are so closely dependent on the vegetation for food and shelter. Vegetation is probably one of the strongest forces of acoustics in the amphitheater you’ll be recording–at least in vegetated areas, as opposed to the topography of grasslands or deserts. I’ll add to that. One of my first gigs was at Microsoft in 1992, when they were coming out with Encarta. The encyclopedia on CD-ROM…cutting edge technology. DS: I remember it well. GH: They had all these pictures from around the world, but they didn’t know what they should sound like. My training as a botanist, and then my experience as The Sound Tracker, has taught me. You can look at a photo, judge the season, judge the time of day…it’s pretty much going to tell you the latitude. All this will tell you how loud and complex the music is going to play. Then I provided the sounds you’d expect to hear, if you were standing in the location of the photograph. DS: So, when you go out in the woods…well, not necessarily just the woods…when you go out into the wild for recording, are you looking at the local vegetation while you’re placing the mics…in addition to listening? GH: Oh, absolutely! In fact, the time of day you’re doing the reconnaissance of an area, is often not the time that you’re going to be doing the recording. Generally, mid-day conditions are somewhat windy, sound does not travel nearly as far as during dawn and dusk, and certainly at night. But this is the time of day that you can see clearly. So, in a way, you’re using your eyes to listen and make your site selection. 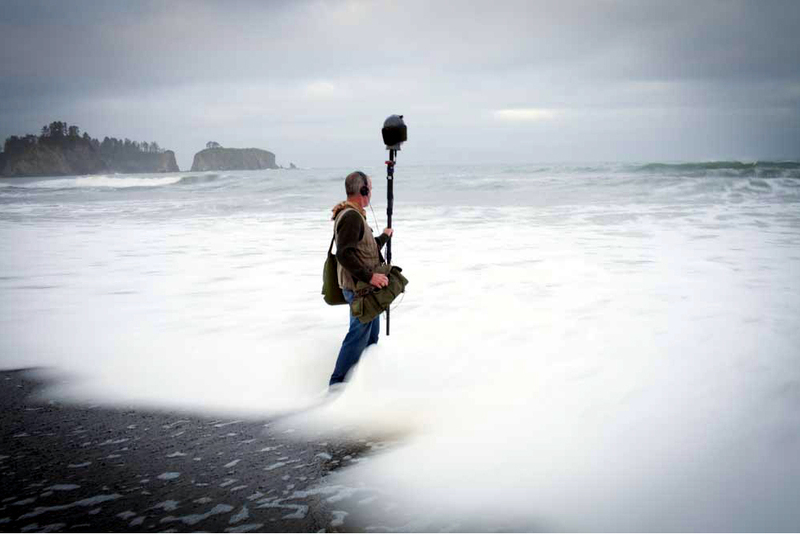 That is the most important choice a field recordist is going to make: where? Based on my experience during dusk, I’ll make my final selection. I’ll flag the area with survey tape; white survey tape. Not a colored survey tape, because it won’t show up that well with a headlamp in the dark. I’ll flag the site, and I come back in the morning…in the dark, before the dawn begins to erase the stars. I’ll find that flagged spot, position the microphone system PRECISELY, and that means it’s going to be exactly where it’s supposed to be. Not 12 inches that way, and not 12 inches the other way, at the height that I want it at, and also facing in the direction it needs to be. All this is determined at dusk, and then I learn from what happens that morning. Depending on what happens and the value of that location, I may repeat the process several times more, over the course of several days. The longest I’ve had to spend at a single location, to get the sound I wanted, was six weeks. DS: Wow! Were you out there ever morning for those six weeks? DS: [laughs] I’m very familiar with that! GH: Yeah, right! But when you get the sound [laughs] then you’re no longer an idiot. You’re a hero! It’s a very fine line. A VERY fine line. I waited it out, I wasn’t about to return after such a long and expensive investment as an idiot. I got it. DS: [laughs] That’s not just an investment of monetary funds, that’s a very personal investment. Six weeks to catch one sound. GH: Oh yeah. That is certainly the most important quality of a nature sound recordist: patience. Patience above intelligence or anything else. If you don’t have patience when you start, nature will teach you patience. DS: have you gone outside of the U.S. borders to do recording? GH: Yes. I’ve circled the world three times. I’ve recorded on every continent except Antarctica. People have asked me why I haven’t recorded Antarctica, and…while I have recorded in Alaska and Canada…there are other people who have recorded in Antarctica. I like to record what I hear, and what I like. I think that’s also an important piece of advice to field recordists. If you’re recording something that you don’t personally like, how can you expect someone else to really like it? It’s not just about creating an interesting recording, it has to be transformative sounds. In my case, I really want the listener, my audience, to in some way be transformed; in some way be brought closer to the truth that we evolved here on planet Earth. We are home. This is our home planet. That, to me, means recording a kind of music that feels healthy and prosperous. In a way, my search for the right location has been a search for our ancestral homeland. After circling the globe several times, it’s clear to me that the Earth is a solar powered juke box. It’s really blessed with the two extremes of what I consider to be too busy, too much going on, just too many players performing at once…and that’s at the equator, in the Amazon…all the way to the arctic and the Antarctic, where there’s hardly any sounds at all except the physical sounds…extreme weather when it’s harsh; and when it’s light, the cacophony of the rookeries. I’m really not hearing any music there. I find that with my perception, my sensitivity, I really enjoy the Central American latitude. Right in there with the sub-tropics and neo-tropics. That’s where I hear most as music. As we go further North, or South, and cross into the temperate latitudes, that’s when we get more of the acoustic performance. It’s not just a sound that we hear, but we also hear the amphitheater itself. We hear the decay of the sound, the return of the sound, and especially when we get to that magic two-second decay. That two-second decay time that matches our man made concert halls. To achieve that really delivers an important message to your audience, which…if you keep in mind…are animals, too. They’re still listening with this ear of the animal. So, when you can present sound that can also present that decay, that acoustic, with it, this signals to your listeners that all the information is arriving. All the information is coming. After all, while a lot of us…even sound people…consider sight to be our primary sense, I don’t believe it is. I find it hard to believe that ANY sense is primary. They all interweave. Every field recordist should keep this in mind. Every higher vertebrate species has the ability to hear. It is absolutely essential to hear in order to survive! Not every higher vertebrate species has the ability of sight. You can still be blind and live in the back of caves or down at the bottom of the ocean, but you can’t be deaf. Even more dramatic than that is that coverings of the ear, the ear equivalent of eye lids, never evolved. That would be far too dangerous. The ability to hear, to listen to your environment, is the ability to stay current with the news, and that’s going to keep you alive. So your audience, all the time…even though they aren’t thinking about it…they’re animal beings. The very animal way of living, deep in the subconscious layer, is listening to stay alive. If you as a field recordist can feed that need for the information flow, then that’s going to be a great recording. DS: In the process of answering that question, you were very articulate about, “I want to record what I like to hear.” How long did it take you to develop an understanding of what it was you wanted to hear? GH: That understanding came about three years into my career as The Sound Tracker. It was about 1983 and I was still thinking about what I wanted to do, where I wanted to place microphones, and even making calculations. I was considering studying to become an acoustician, and I was still STUCK in my head. Then one day I went to a place in Eastern Washington, Pipestone Canyon…one of my favorite places. It has absolutely beautiful acoustics. And I was so frustrated. I came there after careful planning and work, set up my Nagra, and I just wasn’t getting it. I just wasn’t getting the sound! It all sounded flat. It all sounded wrong. I didn’t know what else to think about. I’m not ashamed to admit that I actually came to tears of frustration. I felt I was a total failure. Disappointment is an epiphany in disguise. I learned that that day. Once I was able to admit that I was thinking too much, I got up and used my equipment with nothing but “feel.” I did nothing but walk around with the microphone unit and simply went with what I liked. That’s when my recordings changed dramatically. I realized, “That’s it!” Listening does not come from the brain. Hearing comes from the brain, but listening comes from the heart. That is who you are as a field recordist. You have to be a listener! Gordon continues to work towards the completion of his sound libraries, and remains hopeful that his hearing can be restored. We thank him for taking the time to share his stories with us. 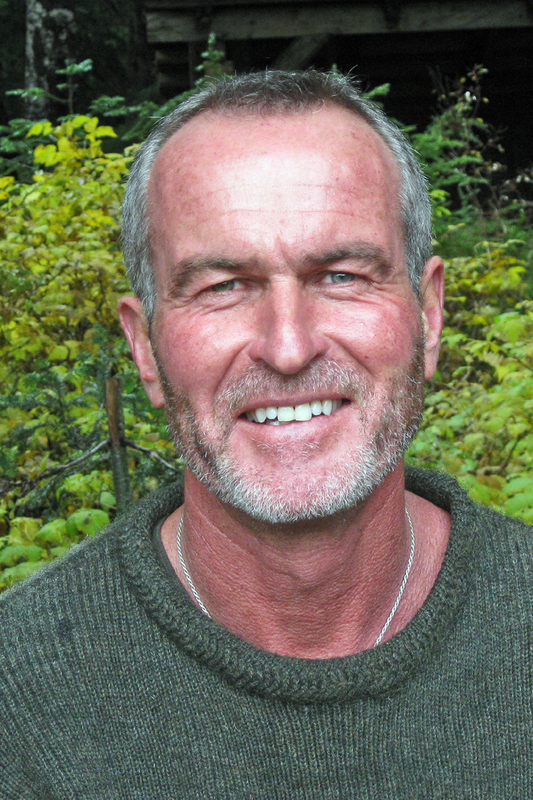 If you’re interested in his libraries or blog, they can be found on the Quiet Planet website. Very interesting and touching read, thank you! So there is. How the hell did that happen? (stupid WordPress) The question is back in. Thanks for pointing that out!